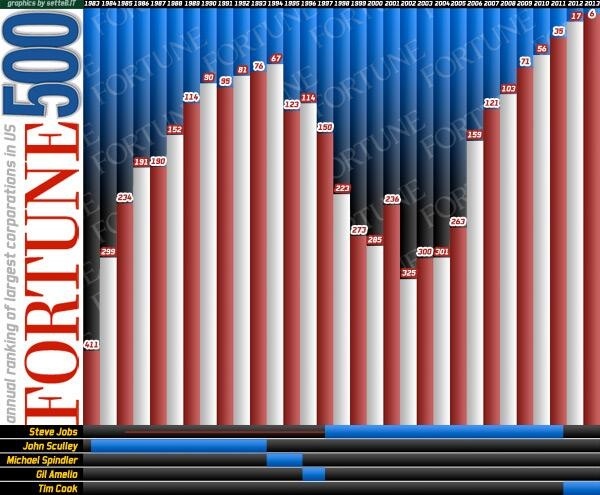 Apple Leaps to #6 in Latest Fortune 500 Rankings - iPhone.MY - Daily News On Mac, iPhone, iPads, iPods and more! Fortune today released its annual “Fortune 500” list, a high-profile ranking of the largest companies in the United States ranked by revenue. In the new rankings, Apple has risen to #6 from its #17 spot in last year’s rankings. Apple is bigger than ever — the company cracked the Fortune 10 this year. But it’s a high-pressure job, being king of the hill. At Apple’s press event this past October, it maintained more than disrupted with its software upgrades and iPad mini announcement. Also, this past year has seen a lot of CEO Tim Cook having to apologize — once in September for the failure of Apple’s maps app, and then to Chinese consumers this April for slow repair services — this in a market that Cook said this past January would be Apple’s largest. Still, when every executive wants to invent the iPod of ___, Apple remains an innovation icon. Wal-Mart edged out ExxonMobil for the top spot in this year’s rankings, with Chevron, Phillips 66, and Berkshire Hathaway also ranking ahead of Apple and its $156.2 billion in revenue. In looking at profits, Apple ranked second among Fortune 500 companies at $41.7 billion, trailing only ExxonMobil at $44.9 billion. Apple is on track for another strong performance this year, having reached $22.6 billion in profit on sales of $98.1 billion in the first half of the year. That compares to earnings of $24.7 billion on $85.5 billion in revenue for the first half of fiscal 2012.
iPhone 6. You won’t believe it. Even when you see it. EA’s Mirror’s Edge™ goes FREE for 24 hours only!